If drivers can eventually keep their hands off the wheel, they’ll want to work on the move, relax, chat or enjoy the onboard entertainment. The classic upright and fixed seating positions would clearly make this tricky. The well-established race to introduce automated and autonomous driving opens up the possibility of new seat positions – not just in vehicles like the forthcoming driverless robo-taxis, but also in the conventional passenger car. But there’s one hurdle that visionaries should consider: the prerequisite for this new-found in-car freedom must come with a high level of occupant safety. ZF is hard at work researching and developing integrated safety features that help make this future feasible. The higher the level of automation, the more unusual the interior concept and seat configuration. “Freedom requires safety”, says Dr. Michael Büchsner, head of the Passive Safety Systems Division at ZF. “That’s why we’re researching and enhancing proven occupant safety systems to give vehicle manufacturers more scope for the required additional seating positions.” Ultimately, a conventional steering wheel airbag may be less effective if the driver has turned the seat by 90 degrees. The same applies to concepts where the steering wheel folds away in auto mode, or indeed where there is no steering wheel. Then there’s the seat belt: being anchored in the car body, it’s not designed to restrain a passenger in an unconventional position – at least, not enough in the current configuration. So what’s a possible solution? “We’re integrating the seatbelt and airbags in the seat itself”, explains Norbert Kagerer, head of Integrated Safety at ZF. “This creates a kind of safety cell in the car that can rotate with the passengers.” Other areas can be covered by airbags that deploy from the dashboard, headliner, between the seats, and so on. Courtesy of a 3D interior camera, vehicles will soon also be able to provide additional information if they detect a crash risk, such as the occupants’ height, their current sitting position and which direction they're looking in. The restraint system can then use this data to help determine the best course of action. Still more information is provided by ZF’s other electronic driver assist systems in conjunction with its environmental sensors. In autonomous driving’s distant future, “drivers” will probably be able to take a nap or spontaneously swivel their seat around to face the rear passengers. But right now, we’re at step one: autonomous driving should soon allow people to move and/or recline their seat further. 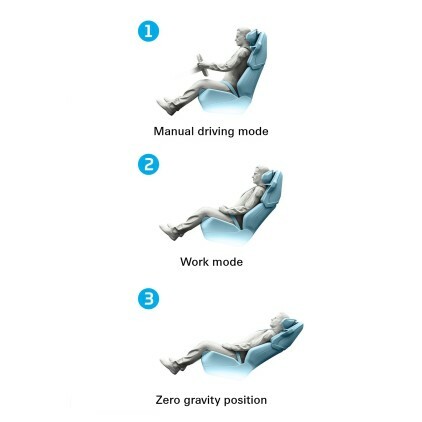 From a safety perspective, this means that in addition to today’s usual position in manual driving mode (1) there are two new positions to consider – work mode (2) and the so-called zero gravity position (3). In the not too distant future: new driver seat settings such as those shown here (2, 3) could soon make automated driving a reality – but not until specific occupant safety systems like those from ZF are available. “Our crash simulators showed that with established restraint systems, in unconventional seating positions, a frontal impact exposes occupants to very high loads even in work mode”, says Dr. Frank Laakmann, head of ZF’s Integrated Safety and Active Restraints development departments. Specifically the risk of head, neck, hip and upper/lower thigh injuries is potentially higher. ZF subsequently ran the same simulation with its new solutions, such as the seat-integrated seatbelt and a dual-stage driver airbag that adjusts to the occupant’s position. This brought the loads back down much closer to their previous, lower level seen for occupants in the traditional position. And this raises another challenge: to date, only one conventional position is crash-tested a certain number of times in real conditions. The prospect of extending this across the board to cover hundreds of different seat positions would be far too impractical. “That’s where our unique competencies in virtual testing come to the fore”, says Büchsner. His team is well-prepared. They are keenly aware of how much is riding on the new safety solutions in terms of the push to maintain occupant safety for the coming autonomous future. "We're researching and enhancing proven occupant safety systems to give vehicle manufacturers more and more scope for the required additional seating positions."